Prostaglandin D2 (PGD2) causes cough and levels are increased in asthma suggesting that it may contribute to symptoms. Although the prostaglandin D2 receptor 2 (DP2) is a target for numerous drug discovery programmes little is known about the actions of PGD2 on sensory nerves and cough. We used human and guinea pig bioassays, in vivo electrophysiology and a guinea pig conscious cough model to assess the effect of prostaglandin D2 receptor (DP1), DP2 and thromboxane receptor antagonism on PGD2 responses. PGD2 caused cough in a conscious guinea pig model and an increase in calcium in airway jugular ganglia. Using pharmacology and receptor-deficient mice we showed that the DP1 receptor mediates sensory nerve activation in mouse, guinea pig and human vagal afferents. In vivo, PGD2 and a DP1 receptor agonist, but not a DP2 receptor agonist, activated single airway C-fibres. Interestingly, activation of DP2 inhibited sensory nerve firing to capsaicin in vitro and in vivo. The DP1 receptor could be a therapeutic target for symptoms associated with asthma. Where endogenous PGD2 levels are elevated, loss of DP2 receptor-mediated inhibition of sensory nerves may lead to an increase in vagally associated symptoms and the potential for such adverse effects should be investigated in clinical studies with DP2 antagonists. Prostaglandin D2 (PGD2) is a major cyclooxygenase product produced by mast cells, with lower levels produced by other cells such as T-helper (Th)2 cells, alveolar macrophages, dendritic cells and platelets [1–4]. Increased levels of PGD2 have been found in asthmatics [5, 6] and following allergen challenge in patients with asthma [7, 8]. PGD2 has many effects in the airways that may contribute to asthma pathophysiology including increased mucus production , vasodilation  and capillary permeability . Inhalation of PGD2 induces bronchoconstriction in normal volunteers and this is more profound in patients with asthma [12, 13]. More recently PGD2 has been demonstrated to possess chemoattractive properties for eosinophils, basophils and Th2 lymphocytes . PGD2 is generated by metabolism of arachidonic acid through the cyclooxygenase pathway and then by PGD synthase enzymes. PGD2 elicits its biological activity through pharmacologically distinct G protein-coupled receptors (GPCR). Initially most of its effects were attributed to activation of the prostaglandin D2 receptor (DP1) and at high concentrations activity at the thromboxane (TP) receptors. However, more recently PGD2 was identified as the cognate ligand for an orphan GPCR (GPR44), which had been identified on inflammatory cells. This receptor was originally named CRTH2 (chemoattractant receptor-homologous molecule expressed on Th2 cells), but is now known as the DP2 receptor in line with prostanoid receptor nomenclature . In recent years significant research effort has been directed into the pro-inflammatory effects of PGD2 and evidence suggests that PGD2, via the DP2 receptor, recruits inflammatory cells to the airways . In line with these observations there are now several DP2 antagonists being trialled for the treatment of asthma and allergic diseases . PGD2 has been shown to cause cough in preclinical studies and in clinical studies following nasal challenge [17, 18]. Furthermore, increased levels of PGD2 are found in the airways of asthmatics [5, 7] and chronic coughers , and it is recognised that sensory nerve associated symptoms like excessive coughing are part of the asthma phenotype. However, nothing is known about the activity of PGD2 on airway sensory nerves. We have shown for the first time that PGD2 causes dose-related cough in guinea pigs and activates single C-fibre airway afferents in vivo via DP1 receptor activation. This finding is supported with pharmacological data in human, guinea pig and gene-deficient mouse vagal tissues confirming a role for the DP1 receptor and suggesting that antagonists at this receptor may be useful for the treatment of symptoms such as cough in patients with asthma. Having found that both DP1 and DP2 are expressed in guinea pig vagal ganglia we further investigated DP receptor modulation of vagal nerve activity. Interestingly, we discovered that activation of the DP2 receptor actually inhibits vagal nerve activity. Therefore, in conditions where endogenous PGD2 levels are elevated, loss of DP2 receptor-mediated inhibition of sensory nerves may lead to an increase in vagally associated symptoms such as cough and should be investigated in clinical studies with novel DP2 antagonists. Male C57BL/6 and BALB/c mice (18–20 g) and Dunkin Hartley guinea pigs (250–350 g) were purchased from Harlan (Bicester, UK). Breeding pairs of mice devoid of one of the following genes Ptgdr (DP1), Gpr44 (DP2), Tbxa2r (TP), Trpa1 and Trpv1 had been backcrossed at least eight times onto their respective backgrounds (DP1, TP, TRPA1 and TRPV1 on a C57BL/6 background; DP2 on a BALB/c background). Experiments were performed under UK Home Office project licence (PPL 70/7212) and procedures strictly adhered to the Animals (Scientific Procedures) Act 1986. Guinea pigs were placed in a plethysmography chamber and vehicle or PGD2 delivered by aerosol via a nebuliser for 10 min. Cough was measured as previously described [20–22]. Guinea pig, airway specific, jugular neurons were labelled, extracted and dissociated as described previously  and in the online supplementary material. For calcium imaging the cells were loaded with 6 μM Fura-2 acetoxymethyl ester (Fura-2 AM). Viability of the cells was assessed by applying 50 mM potassium solution at the start and finish of experiments. PGD2 (1 μM) or capsaicin (0.1 μM) was applied for 70 s. For inhibition experiments, the inhibitor was applied for 10 min and the agonist re-applied in the presence of inhibitor. After a wash period, the agonist was reapplied. Intracellular calcium change was recorded and analysed using Image J (US National Institutes of Health, Bethesda, MD, USA, http://imagej.nih.gov/ij/). Guinea pig jugular ganglia were dissected as described in the previous section and the supplementary material. RNA was extracted and samples reverse-transcribed . Primers and probes for the guinea pig DP1 and DP2 receptors were designed and produced by Applied Biosystems (Life Technologies Ltd, Paisley, UK). Data are expressed as 2-Δct×106 where Δct represents the difference in the expression of the target compared with 18S rRNA. Guinea pigs were anaesthetised with urethane (1.5 g·kg−1) intraperitoneally with neuromuscular blockade using vecuronium bromide (0.10 mg·kg−1 intravenous, followed every 20 min with 0.05 mg·kg−1 i.v.). The trachea was cannulated and lungs ventilated. Both vagus nerves were cut and the left vagus nerve was used for recording. The vagus nerve was teased until a single active unit was obtained and action potentials were recorded as previously described . After a control baseline recording of 2 min, capsaicin (100 μM) was administered by aerosol for 15 s and the changes in fibre activity, intratracheal pressure and blood pressure recorded. Agonists were aerosolised for 60 s at 10-min intervals while recording variables. Verification of a C-fibre was confirmed at the end of the experiment by determining conduction velocity. All animals were subsequently killed with an overdose of pentobarbitone. Guinea pig, mouse and human vagus nerves were dissected, placed in Krebs–Henseleit solution and mounted in a “grease-gap” recording chamber as previously described (further details can be found in the online supplementary material) . Agonists were applied for 2 min followed by Krebs–Henseleit solution. For antagonist experiments, two reproducible responses to agonists were acquired. The antagonist or vehicle was perfused for 10 min and immediately afterwards the agonist was reapplied for 2 min in the presence of the antagonist and the degree of inhibition recorded. Concentrations of antagonists were selected as 100-fold of the pA2 value (a measure of antagonist affinity). PGD2, prostaglandin E2 (PGE2), 15(R)-15-methyl-PGD2, BW245C, BWA868C, CAY10471, SQ29548 were purchased from Cayman Europe (Tallinn, Estonia). Capsaicin and JNJ17203212 were purchased from Sigma-Aldrich (Poole UK). HC-030031 was purchased from Chembridge (San Diego, CA, USA). All salts were from BDH (VWR International Ltd, Poole, UK) and Sigma-Aldrich. Details on preparation of solutions can be found in the online supplementary material. Data are presented as mean±sem and statistical significance was denoted as p<0.05. Paired t-test, Mann–Whitney U-test, Kruskal–Wallis test and repeated measures ANOVA were used as appropriate to the dataset and calculated using GraphPad Prism 5 (GraphPad Software, Inc., La Jolla, CA, USA). PGD2 causes cough and bronchospasm in man . PGD2 caused a dose–dependent increase in the number of coughs (fig. 1). Having established that we could parallel the effect of PGD2 pre-clinically, we then employed a range of in vivo and in vitro systems, selective ligands and gene-deficient mice to investigate the receptors involved. Effect of inhaled prostaglandin D2 (PGD2) in a conscious guinea pig in vivo system on the number of coughs in a 10-min exposure to aerosolised vehicle (0.1 M phosphate buffer) or PGD2 (30, 100, 300 μg·mL−1). Data are presented as mean±sem, n=4–6. PGD2 can activate primary airway specific jugular ganglia (i.e. as assessed by an increase in intracellular calcium) (fig. 2a–c). Furthermore quantitative real-time PCR analysis showed that both the DP1 and DP2 receptors are present in whole guinea pig jugular ganglia (fig. 2d). However, the expression data were performed on whole ganglia and the results should be interpreted with caution given vagal ganglia also contain microvasculature, glial cells and Schwann cells as well as neurons that project all over the viscera. Therefore, the source of the mRNA may not be neuronal. Prostaglandin D2 (PGD2) response in an airway jugular ganglia cell. a) Presence of the retrograde label (DiI) establishes that the cell was innervating the airways. Scale bar=50μm. b) The response to PGD2 is expressed as a ratio of the fluorescence (F340/F380). The grey bar indicates the time the PGD2 was applied. c) The change in calcium, depicted by snapshots of the cell response over time. d) Expression of Ptgdr (DP1) and Gpr44 (DP2) in whole guinea pig jugular ganglia, data are presented as mean±sem, n=8. Inhaled capsaicin, a TRPV1 agonist, was used to identify a single airway C-fibre  (fig. 3a). C-fibres were characterised by their responsiveness to aerosolised capsaicin and their conduction velocities. The C-fibres used in this study had mean±sem conduction velocities of 0.72±0.07 m·s−1 (range: 0.6–0.85 m·s−1). The DP1 receptor agonist (BW245C) and PGD2 caused a burst of firing, whereas the DP2 receptor agonist (15(R)-15-methyl-PGD2) had no effect (fig. 3b and c). Interestingly, PGD2 and the DP2 receptor agonist (but not the DP1 receptor agonist) induced a bronchoconstriction (fig. 3d). Using isolated guinea pig tracheal smooth muscle we confirmed that the PGD2-induced contraction was mediated by the TP receptor (fig. S1). In this system, the DP1 receptor agonist had no effect on tone whereas the DP2 receptor agonist caused contraction, which was inhibited by the TP (and not the DP2) receptor antagonist (fig. S1b and c). The effect of prostaglandin D2 (PGD2) and prostaglandin D2 receptor (DP) agonists on single airway afferent nerve fibres in vivo. a) Example traces of the C-fibre firing following nebulisation of PBS (Veh), capsaicin (Caps) (100 μM, 15 s), BW245C (DP1) (100 μg·mL−1, 60 s), 15(R)-15-methyl-PGD2 (DP2) (100 μg·mL−1, 60 s) or PGD2 (100 μg·mL−1, 60 s). b) The average peak frequency of impulses per second and c) total impulses recorded from a single vagal C-fibre before (white bars) and after (black bars) nebulisation of capsaicin, BW245C, 15(R)-15-methyl-PGD2 or PGD2. d) The bronchospasm assessed by increases in tracheal pressure (PtΔ increase). Data are presented as mean±sem, n=3. *: p<0.05. Preliminary data also suggested that PGD2 and the DP1 agonist can evoke action potential discharge in mechanoreceptors (mid-range, capsaicin-sensitive Aδ fibre conduction velocity (CV) 4.9 m·s−1; and capsaicin-sensitive, classical rapidly adapting receptors (RAR) CV 14.7 m·s−1). At least for the DP1 agonist this is not accompanied by bronchospasm and in both cases this is restricted to capsaicin-sensitive fibres, which suggests that this happens via direct activation of capsaicin-sensitive fibres and via the DP1 receptor/TRPV1–TRPA1 axis. Many tussive agents [25, 26], such as capsaicin, low pH solutions and PGE2, are known vagal sensory nerve stimulants and isolated guinea pig, murine and human vagus nerve preparations have been shown to elicit similar nerve depolarisation responses across the species to these stimulants [20–22]. These data suggest that the isolated vagus nerve is a useful and predictive preparation for conducting comprehensive pharmacological assessments of agents that may activate or inhibit sensory nerve function and, thus, the cough reflex that is not complicated by the pharmacokinetics and other considerations which limit the interpretation of in vivo studies. Using this system, we showed that PGD2 causes a concentration related increase in depolarisation in guinea pig isolated vagal nerves (fig. 4a). In guinea pig isolated vagus nerves, BWA868C (DP1 receptor antagonist) inhibited PGD2-induced depolarisation in a concentration dependent manner (fig. 4b), but not PGE2 (a similar PG known to excite sensory nerve driven responses 22) (data not shown). Furthermore, CAY10471 (DP2 receptor antagonist) and SQ29548 (TP receptor antagonist) had no effect on the response to PGD2 (fig. 4b). In addition, BW245C (DP1 receptor agonist) caused depolarisation in guinea pig vagal nerves, but 15(R)-15-methyl-PGD2 (DP2 receptor agonist) had no effect (fig. 4d). Utilising vagal tissue from gene-deficient mice to corroborate these findings we found that the response to PGD2 (10 μM) is virtually abolished in vagal tissue from the Ptgdr−/− (DP1 receptor deficient) mice, compared with wild type (C57BL/6 and BALB/c), Gpr44−/− (DP2 receptor deficient) and Tbxa2r−/− (TP receptor deficient) mice (fig. 4c). Identification of the receptor involved in prostaglandin D2 (PGD2)-induced activation of guinea pig and mouse isolated vagus. 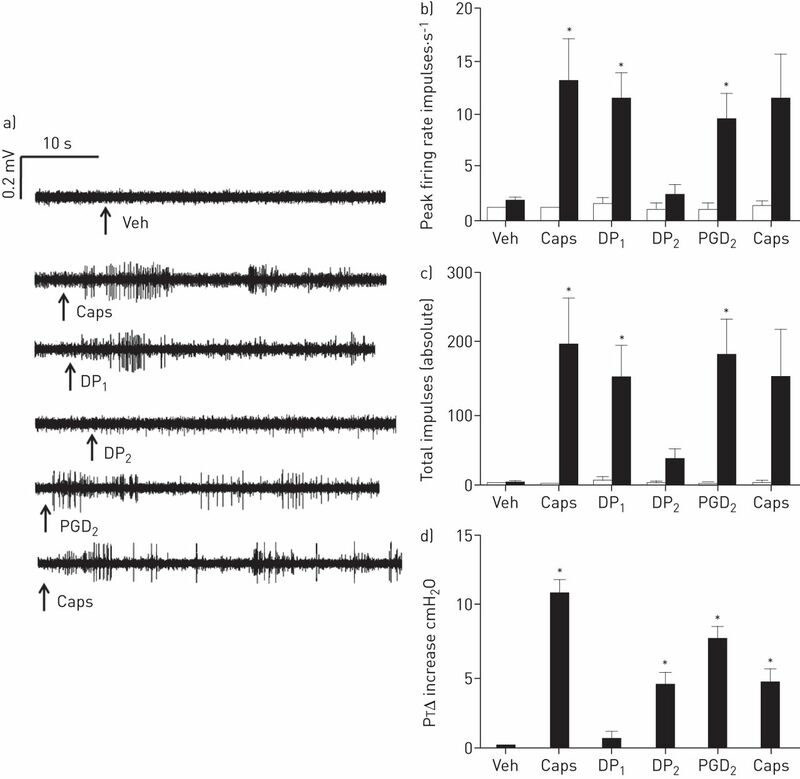 a) Concentration response to PGD2-induced depolarisation in isolated guinea pig vagus nerve. Data are presented as mean±sem, n=4. 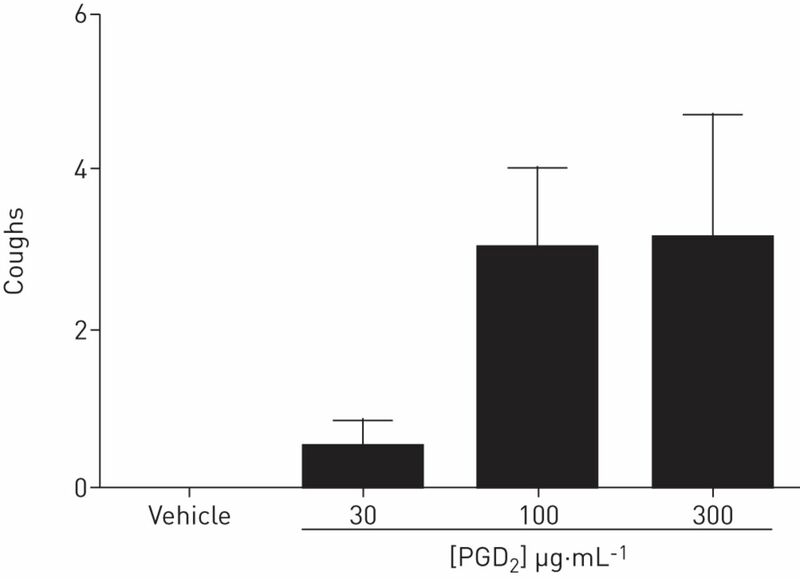 b) Percentage inhibition in the guinea pig isolated vagus nerve of PGD2 (10 μM) by vehicle (0.1% DMSO), prostaglandin D2 receptor (DP1) (BWA868C) (0.1, 1, 10 μM), 10 μM DP2 receptor antagonist (CAY10471) and 1 μM thromboxane receptor antagonist (SQ29548). Data are presented as mean±sem, n=4–6. *: p<0.05 comparing responses before and after antagonist using a paired t-test. c) The effects of PGD2 (10 μM) in prostanoid receptor deficient mice. Depolarisation in isolated nerves comparing wild type C57BL/6 to Ptgdr−/− and Tbxa2r−/− mice and wild type BALB/c to Gpr44−/− mice. Data are presented as mean±sem, n=4–6. *: p<0.05 comparing responses in receptor deficient tissue to the respective wild type using Kruskal–Wallis or Mann–Whitney U-test. d) The response to selective DP receptor agonists in guinea pig isolated vagus nerve. Depolarisation to BW245C (DP1, 10 μM) and 15(R)-15-methyl-PGD2 (DP2, 10 μM). Data are presented as mean±sem, n=4. 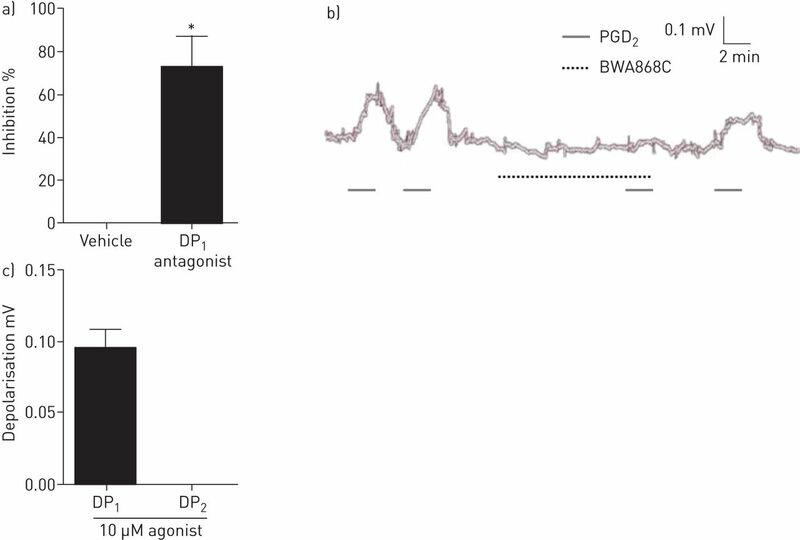 The DP1 receptor antagonist BWA868C significantly inhibited PGD2-induced depolarisation (fig. 5a and b) and the DP1, but not the DP2 receptor agonist, caused depolarisation of human vagus (fig. 5c). An example trace of the inhibitory effects of BWA868C can be seen in figure 5b. Identification of the receptor involved in prostaglandin D2 (PGD2)-induced depolarisation of human isolated vagus nerve. a) Percentage inhibition of PGD2-induced (10 μM) depolarisation of human isolated vagal nerves by vehicle (0.1% DMSO) or 10 μM prostaglandin D2 receptor (DP1) antagonist (BWA868C). Data are presented as mean±sem, n=4–5. *: p<0.05, paired t-test. b) An example trace showing inhibition of PGD2-induced depolarisation by BWA868C in the human vagus. c) The response to selective DP agonists in human isolated vagus nerve. Depolarisation to 10 μM BW245C (DP1) and 10 μM 15(R)-15-methyl-PGD2 (DP2). Data are presented as mean±sem, n=3. The DP1 receptor is a GPCR and it is likely that following ligand binding it regulates ion channels involved in the post-receptor signalling pathway to evoke depolarisation. TRPV1 and TRPA1 are ion channels known to be expressed on sensory nerves and activation of these is known to evoke cough in guinea pig conscious cough models and in man [20, 26]. The depolarisation to PGD2 in guinea pig isolated vagal nerves was partially inhibited by TRPV1 (JNJ17203212) and TRPA1 (HC030031) antagonists at concentrations previously shown to maximally inhibit TRPV1 and TRPA1 agonists, respectively (fig. 6a) . Furthermore, the responses in isolated nerves from Trpv1−/− and Trpa1−/− mice were significantly reduced compared with wild type (fig. 6b). This suggests a role for both TRPV1 and TRPA1 in the depolarisation induced by PGD2. The post receptor signalling pathway involved in prostaglandin D2 (PGD2)-induced nerve depolarisation. a) Inhibition of PGD2-induced guinea pig vagal nerve depolarisation by TRPV1 antagonist (100 μM JNJ17203212) or TRPA1 antagonist (10 μM HC030031). Data are presented as mean±sem, n=4. *: p<0.05, paired t-test. b) Magnitude of depolarisation to PGD2 (10 μM) in isolated mouse vagal nerves from wild type C57BL/6, Trpv1−/− or Trpa1−/− mice. Data are presented as mean±sem, n=6. *: p<0.05, Kruskal–Wallis test. The data presented so far provides strong evidence that PGD2 activates airway sensory nerves via the DP1 and not the DP2 receptor. However, both receptors are expressed on the vagal jugular ganglia. Although the DP2 receptor does not activate vagal nerves it is still possible that the receptor may modulate sensory nerve activity. Using guinea pig isolated vagal nerves and airway specific jugular ganglia cells we discovered that the DP2 receptor agonist inhibited responses to the sensory C-fibre stimulant capsaicin (fig. 7a and b). This effect translates to man as the DP2 agonist also inhibited capsaicin-induced depolarisation in human isolated vagus nerve (fig. 7c). Furthermore, using guinea pig isolated vagus nerves, we have shown that the inhibitory effect on the capsaicin signal is blocked by a DP2 receptor antagonist (fig. 7d). Finally, we have illustrated the inhibitory effect of the DP2 receptor in vivo as the DP2 receptor agonist significantly reduced capsaicin-induced C-fibre single afferent firing (fig. 8). Prostaglandin D2 receptor 2 (DP2) agonist-induced inhibition of vagal nerve activation in vitro. a) Inhibition of capsaicin-induced depolarisation by vehicle (ethanol, 0.1%) or 15(R)-15-methyl-prostaglandin D2 (PGD2) (DP2 agonist, 0.1 μM) in isolated guinea pig vagal nerves. Data are presented as mean±sem, n=4. b) Inhibition of capsaicin-induced calcium movement in airway jugular cells by 15(R)-15-methyl-PGD2 (DP2 agonist, 0.01 μM). Data are presented as mean±sem, n=5 guinea pigs, consisting of 14 airways cells for vehicle and 17 airway cells for DP2 agonist. c) Inhibition of capsaicin-induced depolarisation by vehicle (ethanol, 0.1%) or 15(R)-15-methyl-PGD2 (DP2 agonist, 0.1 μM) in isolated human vagal nerves. Data are presented as mean±sem, n=3. d) Antagonism of 15(R)-15-methyl-PGD2-mediated inhibition of nerve depolarisation with a selective DP2 antagonist (CAY10471, 10 μM) in isolated guinea pig vagal nerves. Data are presented as mean±sem, n=4. *: p<0.05 for the effect of agonist by paired t-test; #: p<0.05 for the effect of antagonist by unpaired t-test. Prostaglandin D2 receptor 2 (DP2) agonist-induced inhibition of capsaicin-induced firing of airway single C-fibre afferents in vivo. Capsaicin (Caps) was nebulised into the airways of an anaesthetised guinea pig and the firing recorded from a single afferent C-fibre. PBS was nebulised followed by a second capsaicin response. After 10 min, 15(R)-15-methyl-prostaglandin D2 (PGD2) (100 μg·mL−1) was administered and capsaicin reapplied after 10 min and again at 45 min. Data expressed as a) peak impulses per second and b) total impulses. Data are presented as mean±sem, n=3. *: p<0.05 in a one-way ANOVA repeated measures test comparing the responses to capsaicin before and after 15(R)-15-methyl-PGD2. PGD2 is released from mast cells, Th2 cells and dendritic cells [1–4], it is increased in the airways of patients with asthma [5, 6] and there is strong evidence to suggest that it may be involved in the allergic inflammatory response that characterises asthma and allergic rhinitis. In support of this contention are data demonstrating that mice deficient in the DP1 receptor do not develop an asthmatic phenotype in an ovalbumin-induced asthma model . Furthermore, in a guinea pig model of allergic airway inflammation, a selective DP1 receptor antagonist, S-5751, reduced antigen-induced nasal blockage, plasma exudation in the conjunctiva, and inflammatory cell infiltration into the upper and lower airways . The prostaglandin D receptor gene (PTGDR) has also been implicated in the asthma phenotype as a result of linkage and association analyses in human subjects  and reports that specific variants in the PTGDR promoter are associated with asthma . PGD2 is also thought to contribute to symptoms such as excessive cough [17, 18]. Asthma and nonasthmatic eosinophilic bronchitis are among the most common causes of chronic cough. Interestingly, mast cell mediators such as histamine and PGD2 are increased in sputum in nonasthmatic eosinophilic bronchitis, suggesting that activation of mast cells is a particular feature of this condition and that mast cell mediators may be responsible for the cough . However, our understanding of the mechanisms involved in PGD2-induced cough is limited. PGD2 activates DP1, DP2 and TP receptors, but it is not known which receptor and post-receptor signalling pathways are involved in the activation of airway sensory nerves and the cough reflex. In order to investigate this further we wanted to identify an appropriate preclinical model system. We decided to use the guinea pig as this species is commonly used to investigate airway sensory nerve biology and guinea pigs cough in a similar fashion to humans in response to a range of tussive agents [20, 21, 26]. PGD2 evoked cough in conscious guinea pigs. This was shown to be an effect on airway specific afferents evidenced by the observation that PGD2 evoked calcium influx into airway specific jugular cells. Furthermore, PGD2 and a selective DP1 receptor agonist, but not a DP2 receptor agonist, caused C-fibre firing in an in vivo electrophysiological model . Using a range of pharmacological tools and vagal tissue from receptor deficient mice (although mice do not cough their vagal afferent responses are in many cases similar and comparable to guinea pigs and humans) we have provided significant evidence to suggest that the PGD2-induced sensory nerve activation is mediated by the DP1 (and not DP2 or TP) receptor. The TP receptor was investigated alongside DP1 and DP2, even though TP receptor agonists are not thought to cause cough , because PGD2 is known to mediate airway smooth muscle contraction through the TP receptor [32, 34], a finding that was confirmed in this study. One possibility that cannot be ruled out is that PGD2-induced bronchoconstriction (via TP activation) could cause cough indirectly via activation of mechanosensitive RARs. However, selective activation of the DP1 receptor can evoke action potential firing independent of bronchospasm favouring the theory that it is direct activation of airway afferents that causes PGD2-induced cough. Clinically relevant data was also presented confirming the findings above and demonstrating, for the first time, a role for DP1 receptor activation by PGD2 in human vagal tissue. The DP1 receptor is generally thought to be coupled to the G-protein Gs, suggesting that activation of the DP1 receptor would cause an increase in cAMP [35, 36]. However, this is in contrast to our previous research in similar biological systems, which suggests that elevation of cAMP has an inhibitory effect on airway sensory nerve activation . Interestingly, and more consistent with the data shown here, cells expressing DP1 receptors have also been shown to elicit an increase in intracellular calcium when stimulated by PGD2 or the selective DP1 agonist BW245C . 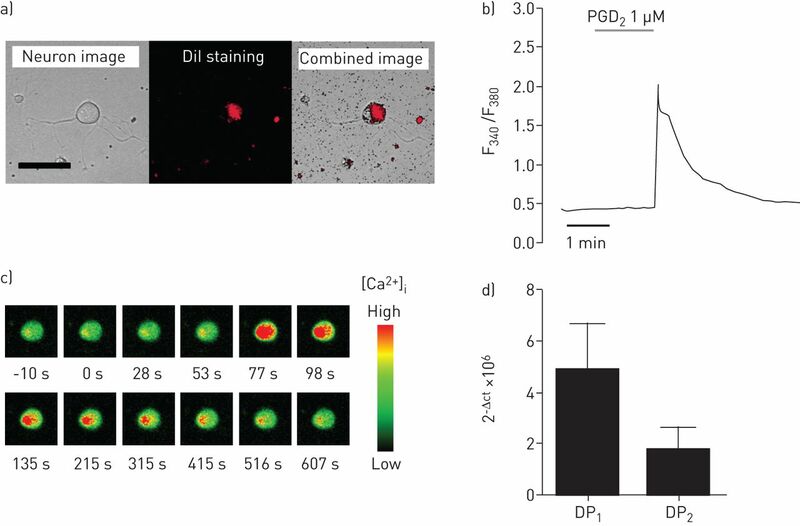 This increase in intracellular calcium appears to be cAMP-dependent and may result from the activation of protein kinase A (PKA) and subsequent involvement of L-type Ca2+ channels and the ryanodine receptor . The mechanisms downstream of GPCR coupling that lead to activation of ion channels are not yet fully understood, but phospholipase C (PLC) and PKA pathways are thought to be important in the signalling for a number of TRP channels [39–41]. GPCR binding to Gq-coupled receptors can lead to activation of PLC, hydrolysis of phosphatidylinositol-(4,5)-bisphosphate (PIP2) to yield inositol-(1,4,5)-trisphosphate (IP3), production of diacylglycerol (DAG) and activation of protein kinase C (PKC). PKC and DAG have been found to directly bind the TRPV1 receptor, and IP3-induced release of intracellular calcium stores may be involved in activation of TRPA1. Moreover, PIP2 is thought to constitutively inhibit TRP receptors. Therefore, its hydrolysis by PLC may disinhibit these ion channels, sensitising them to subsequent stimulation . Alternatively, PKA-dependent phosphorylation can occur through activation of Gs-coupled receptors, thereby enhancing ion channel excitability . The TRPV1 and TRPA1 ion channels are known to be expressed on airway sensory nerves and agonists at these receptors cause cough [20, 21, 25]. In this study, we have shown that both TRPV1 and TRPA1 mediate the downstream response to PGD2 following DP1 receptor activation. Both the TRPV1 and TRPA1 antagonists partially inhibited the depolarisation response to PGD2. Furthermore, in vagal tissue from Trpv1−/− and Trpa1−/− mice the response to PGD2 was significantly reduced. These channels have also been implicated in cough induced by PGE2 acting via the prostaglandin E receptor 3 . Throughout the body, the DP1 receptor is either undetectable or expressed at low levels in tissues [35, 36], whereas the DP2 receptor is widely distributed . In guinea pig vagal ganglia we have detected both DP1 and DP2 mRNA. However, whole vagal ganglia also contain other cell types including Schwann cells, glial cells and microvasculature as well as neurons that project into the viscera and so identification of DP receptors in these samples does not provide conclusive evidence. Therefore, in this study we have elucidated a function for the DP1 receptor in activating airway sensory nerves and eliciting reflex events such as cough. However, a selective DP2 receptor agonist did not cause depolarisation and a DP2 antagonist did not inhibit the response to PGD2. In addition to causing depolarisation agents have also been shown to sensitise nerves to the effects of other stimuli [43, 44] or inhibit nerve activation . We investigated this further and found that a DP2 receptor agonist inhibited capsaicin-induced activation of airway jugular ganglia cells, and isolated vagal nerves from both guinea pig and human, and that this effect was blocked by a DP2 receptor antagonist. Furthermore, this was confirmed in the in vivo single fibre recording model in which capsaicin-induced action potential firing was reduced following the administration by an aerosol of a DP2 receptor agonist. In fact, the modest cough responses evoked by PGD2 in this study and the interesting observation that DP2 receptor activation may inhibit C-fibre discharge may suggest that a DP2 receptor antagonist could enhance the cough responses evoked by PGD2. Since the discovery that DP2 receptor antagonists could inhibit allergen-induced inflammation there has been a major focus for drug discovery in the asthma area over recent years and there are several compounds in clinical trials . 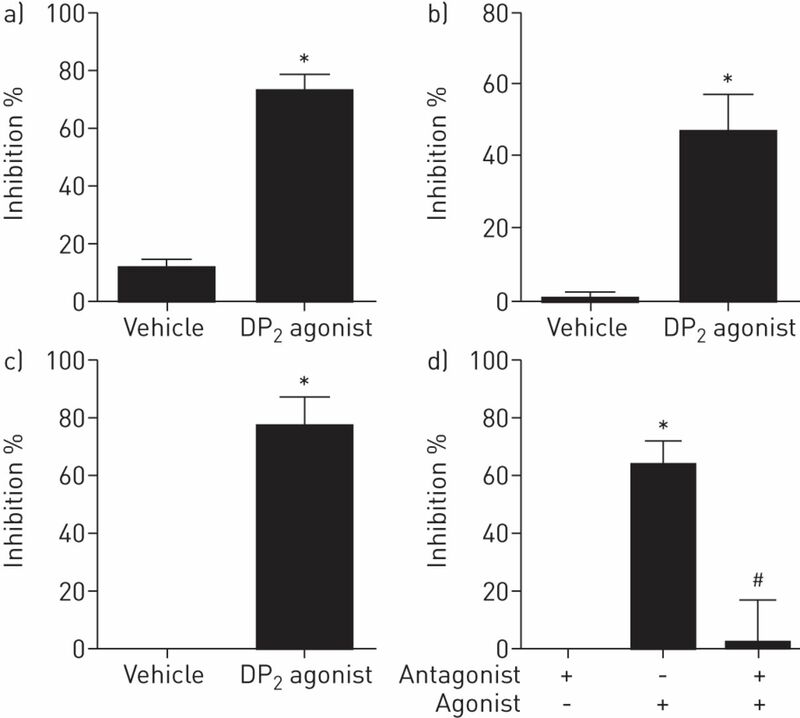 However, this data would suggest that caution should be exercised when developing DP2 antagonists for asthma as preventing DP2 receptor activation (especially when endogenous PGD2 production is high as is possible in allergic diseases) may be detrimental and result in inappropriate stimulation of airway reflexes. In conclusion, there is strong evidence to suggest that mast cell mediators such as PGD2 may be involved in the symptoms associated with the allergic inflammatory response that characterises asthma and allergic rhinitis. There is also evidence suggesting that this involves, at least in part, DP1 receptor activation. However, in spite of the encouraging data from asthma genetic association studies, preclinical studies using pharmacological interventions and DP1 receptor knockout mice in asthma models, DP1 receptor antagonists have been disappointing in clinical studies and are not currently used therapeutically. In particular, the DP1 antagonist laropiprant had no efficacy in patients with allergic rhinitis and asthma where forced expiratory volume in 1 s was the primary end-point . The evidence we present here demonstrates PGD2 activates airway sensory nerves to evoke cough and provides clear evidence for the involvement of DP1 receptors in airway reflex events. This data suggests that this target should be revisited in clinical trials specifically configured to look at symptoms, utilising new clinical tools such as objective cough measurement [46, 47]. Ptgdr−/−, Tbxa2r−/− mice were kindly supplied by Shuh Narumiya (Kyoto University, Kyoto, Japan) and Takayuki Maruyama (ONO Pharmaceuticals, Osaka, Japan). Gpr44−/− mice were kindly supplied by Hiroyuki Hirai (BML Inc., Tokyo, Japan) and Masataka Nakamura (Tokyo Medical and Dental University, Tokyo, Japan). Support statement: S.A. Maher and M.S. Grace were funded by project grants from the Medical Research Council (MRC, UK) (G0800195; MR/K020293/1). S.J. Bonvini and M.A. Wortley were supported on National Heart and Lung Institute Trust and MRC studentships, respectively. E.D. Dubuis was funded by a Wellcome Trust project grant (089301/Z/09/Z) and Boehringer Ingelheim. The human tissue experiments in this study were undertaken with the support of the NIHR Respiratory Disease Biomedical Research Unit at the Royal Brompton and Harefield NHS Foundation Trust and Imperial College London. Prostaglandin D2 generation after activation of rat and human mast cells with anti-IgE. J Immunol 1982; 129: 1627–1631. Biosynthesis of prostaglandin D2. 1. Formation of prostaglandin D2 by human platelets. Prostaglandins 1977; 13: 225–234. Synthesis of leukotriene B4, and prostanoids by human alveolar macrophages: analysis by gas chromatography/mass spectrometry. Prostaglandins 1984; 27: 163–179. Cutting edge: differential production of prostaglandin D2 by human helper T cell subsets. J Immunol 2000; 164: 2277–2280.
. Mediator concentrations in bronchoalveolar lavage fluid of patients with mild asymptomatic bronchial asthma. Eur Respir J 1992; 5: 190–195. Evidence for elevated levels of histamine, prostaglandin D2, and other bronchoconstricting prostaglandins in the airways of subjects with mild asthma. Am Rev Respir Dis 1990; 142: 126–132. Release of prostaglandin D2 into human airways during acute antigen challenge. N Engl J Med 1986; 315: 800–804. Spectrum of prostanoid release after bronchoalveolar allergen challenge in atopic asthmatics and in control groups. An alteration in the ratio of bronchoconstrictive to bronchoprotective mediators. Am Rev Respir Dis 1989; 139: 450–457.
. Effects of arachidonic acid, monohydroxyeicosatetraenoic acid and prostaglandins on the release of mucous glycoproteins from human airways in vitro. J Clin Invest 1981; 67: 1695–1702.
. Inflammatory effects of prostaglandin D2 in rat and human skin. Br J Pharmacol 1976; 56: 229–233.
. The possible role of prostaglandin D2 in the long-lasting airways vasodilatation induced by allergen in the sensitized pig. Acta Physiol Scand 1991; 143: 93–103. The bronchoconstrictor effect of inhaled prostaglandin D2 in normal and asthmatic men. N Engl J Med 1984; 311: 209–213.
. Effect of inhaled prostaglandin D2 in normal and atopic subjects, and of pretreatment with leukotriene D4. Thorax 1997; 52: 513–518. Prostaglandin D2 is a potent chemoattractant for human eosinophils that acts via a novel DP receptor. Blood 2001; 98: 1942–1948.
. International Union of Basic and Clinical Pharmacology. LXXXIII: classification of prostanoid receptors, updating 15 years of progress. Pharmacol Rev 2011; 63: 471–538.
. Update on the development of antagonists of chemoattractant receptor-homologous molecule expressed on Th2 cells (CRTH2). From lead optimization to clinical proof-of-concept in asthma and allergic rhinitis. J Med Chem 2012; 55: 2915–2931.
. Physiologic responses to intranasal dose-response challenges with histamine, methacholine, bradykinin, and prostaglandin in adult volunteers with and without nasal allergy. J Allergy Clin Immunol 1990; 86: 924–935.
. Tussive activity of inhaled PGD2 in the cat and characterisation of the receptor(s) involved. Prostaglandins Leukot Med 1984; 14: 153–159. Induced sputum inflammatory mediator concentrations in chronic cough. Am J Respir Crit Care Med 2004; 169: 15–19. TRPA1 agonists evoke coughing in guinea pig and human volunteers. Am J Respir Crit Care Med 2009; 180: 1042–1047. Transient receptor potential channels mediate the tussive response to prostaglandin E2 and bradykinin. Thorax 2012; 67: 891–900.
. Prostaglandin E2 mediates cough via the EP3 receptor: implications for future disease therapy. Am J Respir Crit Care Med 2009; 180: 923–928. Second-generation inhibitors demonstrate the involvement of p38 mitogen-activated protein kinase in post-transcriptional modulation of inflammatory mediator production in human and rodent airways. J Pharmacol Exp Ther 2006; 316: 1318–1327. RSD931, a novel anti-tussive agent acting on airway sensory nerves. Br J Pharmacol 2003; 138: 407–416. Capsazepine inhibits cough induced by capsaicin and citric acid but not by hypertonic saline in guinea pigs. J Appl Physiol 1995; 79: 1082–1087.
. A comparative study of the effects of citric acid, capsaicin and resiniferatoxin on the cough challenge in guinea-pig and man. Pulm Pharmacol 1993; 6: 171–175.
. Prostaglandin D2 as a mediator of allergic asthma. Science 2000; 287: 2013–2017. Prevention of allergic inflammation by a novel prostaglandin receptor antagonist, S-5751. J Pharmacol Exp Ther 2001; 298: 411–419. Linkage/association study of a locus modulating total serum IgE on chromosome 14q13-24 in families with asthma. Thorax 2004; 59: 876–882. Role of prostanoid DP receptor variants in susceptibility to asthma. N Engl J Med 2004; 351: 1752–1763.
. Cough due to asthma and nonasthmatic eosinophilic bronchitis. Lung 2010; 188: Suppl. 1, S13–S17.
. Effects of a thromboxane receptor antagonist on prostaglandin D2 and histamine induced bronchoconstriction in man. Br J Clin Pharmacol 1994; 37: 97–100. Participation of thromboxane A2 in the cough response in guinea-pigs: antitussive effect of ozagrel. Br J Pharmacol 2000; 131: 266–270. Effect of a thromboxane receptor antagonist on PGD2- and allergen-induced bronchoconstriction. J Appl Physiol 1989; 66: 1685–1693. Molecular cloning and characterization of the human prostanoid DP receptor. J Biol Chem 1995; 270: 18910–18916. Molecular characterization of a mouse prostaglandin D receptor and functional expression of the cloned gene. Proc Natl Acad Sci USA 1994; 91: 11192–11196. 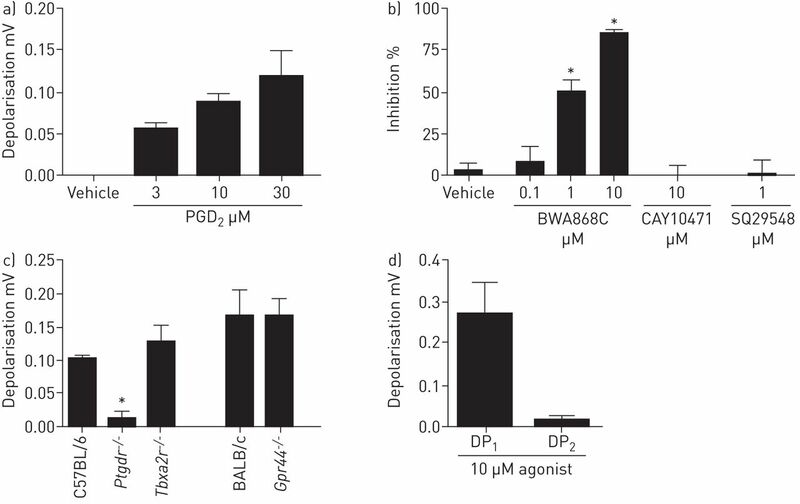 Beta2-agonists block tussive responses in guinea pigs via an atypical cAMP-dependent pathway. Eur Respir J 2010; 35: 647–654.
. cAMP signal transduction in the heart: understanding spatial control for the development of novel therapeutic strategies. Br J Pharmacol 2009; 158: 50–60. Bradykinin and nerve growth factor release the capsaicin receptor from PtdIns(4,5)P2-mediated inhibition. Nature 2001; 411: 957–962. Phospholipase C and protein kinase A mediate bradykinin sensitisation of TRPA1: a molecular mechanism of inflammatory pain. Brain 2008; 131: 1241–1251.
. Breathtaking TRP channels: TRPA1 and TRPV1 in airway chemosensation and reflex control. Physiology 2008; 23: 360–370. Molecular pharmacology of the human prostaglandin D2 receptor, CRTH2. Br J Pharmacol 2002; 137: 1163–1172. Effects of prostaglandin D2 on tetrodotoxin-resistant Na+currents in DRG neurons of adult rat. Pain 2011; 152: 1114–1126.
. Sensitivity of the human cough reflex: effect of inflammatory mediators prostaglandin E2, bradykinin, and histamine. Am Rev Respir Dis 1989; 140: 137–141. Clinical studies of the DP1 antagonist laropiprant in asthma and allergic rhinitis. J Allergy Clin Immunol 2009; 124: 942–948. Objective measurement of cough in otherwise healthy volunteers with acute cough. Eur Respir J 2013; 41: 277–284. A comparison of objective and subjective measures of cough in asthma. J Allergy Clin Immunol 2008; 122: 903–907.